Do your students struggle with possessive nouns and have trouble determining which words need apostrophes? 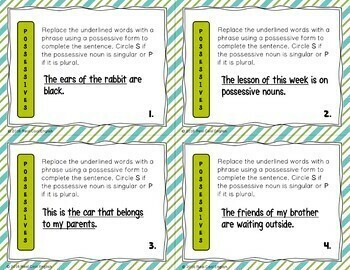 These task cards will give them practice using singular and plural possessives and using apostrophes appropriately. 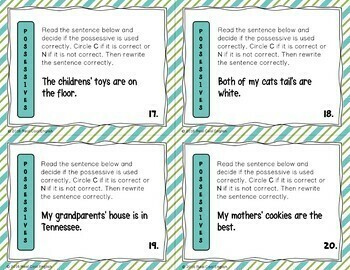 ★ 16 task cards to rewrite a sentence using a possessive noun. 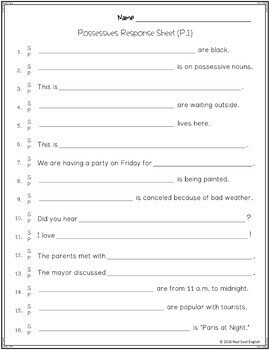 A phrase showing possession is underlined, and the students need to rewrite the sentence using a possessive noun. 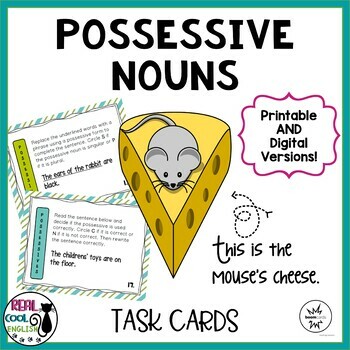 ★ 16 task cards with sentences using possessive nouns. Students determine if the possessive is used correctly, and if not they need to rewrite the sentence using the correct possessive form. ★ Free bonus! Digital version included: Boom Cards. Try out a few Boom Cards HERE. New to Boom Cards? Read "More About Boom Learning" below for information on how they work.